Hello there and hope you are all well and happy. 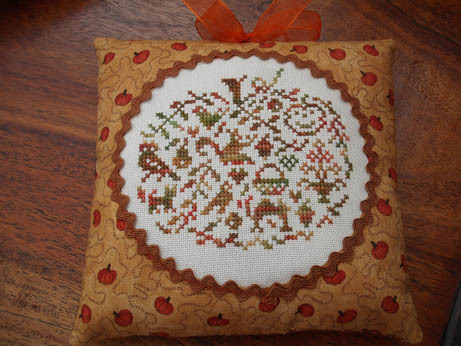 I have had a lovely parcel in the post – my Autumn exchange piece for the Seasonal Exchange blog which has come from Conny at Creative Basket.It is from my favourite designer JBW and is called French Country Pumpkin 4. 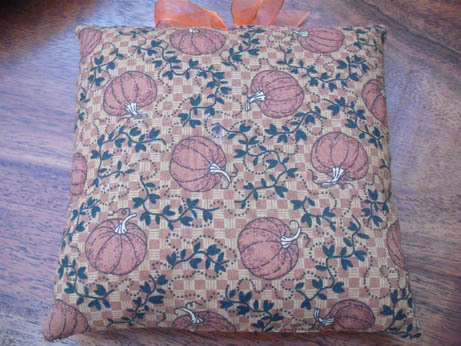 I love it – especially the finishing with the two different pumpkin fabrics and the very clever outlining. I have just finished stitching my piece for the exchange and will be posting it tomorrow. Can’t show any pics till it arrives at its destination which should take a week or so. I have also just finished another Xmas ornie – I did post the WIP for this a couple of weeks ago when I had nearly completed the stitching. 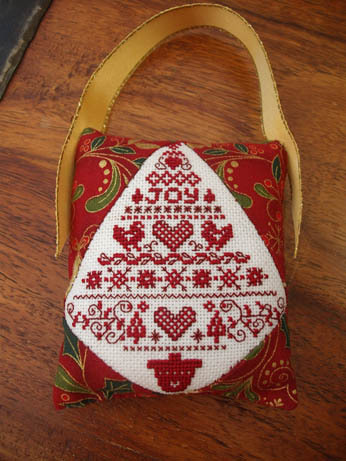 This design is from the Christmas edition of Cross Stitcher magazine and I really liked the Scandinavian style, especially the backstitching. I decided to do a slightly different finish with the ornie to fit in with the shape of the stitching. It was a bit tricky to fit the pieces round the design but it looks ok at the end (if a little asymmetrical but never mind!) I have used the Makower Joyful fabric for both front and back.Not that long now till we can get the tree out and display all the lovely new ornies! It has been a lovely sunny weekend – I have had another busy week so I have had a very nice relaxing weekend with mainly cooking and stitching. I also made it to my monthly knitting group this week so the wristwarmers are nearly finished.I am really looking forward to next weekend as I have a week off work and I am off to Spain again – lucky me! I have not got many plans as just really want a relax but Mum and I are planning a couple of trips out to see some more history so I will take some nice pics for you all. Thank you very much for visiting and see you all again soon.